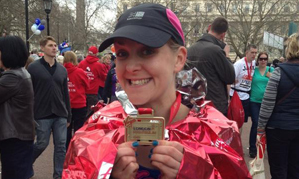 Kelly was inspired to do the London marathon by her auntie, who sadly passed away from Motor Neurones disease. It was her goal to run before she was 30, and in her 30th year she managed it! The Marathon was a big challenge for Kelly who hadn’t run further than a mile before, so big changes needed to be made to tackle the challenge ahead. Kelly has worked for Reynolds for over seven years, starting first as a part time student when she was 14 years old, progressing to full time study in Performing Arts when she was 16 years old, and returned to become a full time employee in January 2006. Kelly worked her way up from dance tutor, progressing to an assessor, then to a dance school manager and is now Programme Manager for Reynolds Performing Arts. Taking advantage of the facilities at our fitness spa in Bexley, Kelly trained 2-3 times a week for the Marathon, working on the treadmill and cross trainer, stretching on the power plate and dancing throughout the week. Fighting hard through the training, she cut out alcohol and followed a strict training plan and diet, doing her long runs on Sundays. Having experienced ups and downs in her training, running through blizzards and being chased by the occasional dog, Kelly was right on schedule. Kelly managed to raise an astounding £3500 for her Motor Neurones Disease charity. Congratulations to Kelly on a fantastic achievement, an inspiration to us all. If you would like to donate click here or to find out more about Motor Neurones Disease please click here. More about Reynolds Performing Arts here.